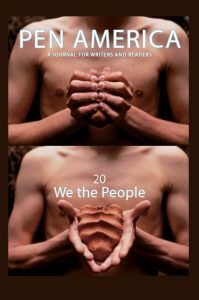 The spirit of Frederick Douglass guides us: “not we the white people, not even we the citizens, not we the privileged class, not we the high, not we the low, but we the people.” In Issue 20, Eliot Weinberger and Valeria Luiselli contemplate walls. Anne Enright, Marlon James, and francine j. harris consider escape. Dilruba Ahmed and Anita Augustin look at endings. Gabriel Orozco shares art from Mexico and around the globe and talks with Colm Tóibín about language, image, and imagination. With fiction by Vivian Abenshushan, Jamaica Kincaid, Walter Mosley, Ahmed Naji, and Antoine Volodine; poetry by Aziza Barnes, Brigit Pegeen Kelly, Gala Mukomolova, sam sax, and Solmaz Sharif; and conversations with Ayad Akhtar, Rozina Ali, Kwame Anthony Appiah, Haroon Moghul, Salman Rushdie, and Lila Azam Zanganeh. AVAILABLE ON KINDLE, NOOK, and IBOOKS.